When Australia was first colonised in 1788 it was commonly understood among the settlers that Australia was Terra Nullius, a Latin phrase meaning ‘land that belongs to no one'. Most European settlers believed that they had a moral and legal right to the land that they were settling and few understood or believed that they were displacing the Aboriginal Australians. It became apparent, however, that the Aboriginal population not only regarded Australia as their rightful land but were prepared to fight for it. One of the blacks, mortally wounded, made it to a cave and died there. He was found years after, sitting in an upright position, petrified, and was one of the sights of those wonderful caves, until he was stolen and taken to England where he was exhibited. The lesson given the blacks that day made them understand that they must respect the lives of white men. Hamilton J C, quoted in Pascoe, B 2007 Convincing ground: learning to fall in love with your country, Aboriginal Studies Press, Canberra, A.C.T. 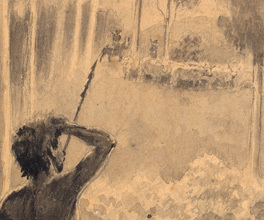 Frontier violence was common in most parts of country Victoria throughout the 19th century, with both sides taking part. One of the main debates of history in Australia is whether terms like 'war' and 'guerrilla warfare' should be used to describe these events. Certainly pastoralists such as Angus MacMillan were responsible for killing large numbers of Aboriginal men, women and children. For many European settlers and pastoralists frontier violence was a subject they preferred to ignore. The newspapers of the day, for example Melbourne’s The Argus, often chose not to report the violence. They gave little attention to the persistent hunger and disease Indigenous Victorians faced as a result of being displaced from their land. Instead it was left to a few compassionate settlers to advocate on the part of the Aboriginal Australians. To have Her Majesty represented by a man [the Governor of Queensland] who coolly sits with folded arms while deliberate massacres of tribes of aboriginal men, women, and infants goes on, almost daily, not only tarnishes the lustre of the crown, but brings disgrace on Her Majesty’s reign. Dawson risked angering very powerful people, not only in the colonies but also in England. Dawson advocated for compensation for the Aboriginal people of Victoria and wrote passionate letters about it. He was not alone and the calls for compensation eventually led to the small step of granting land in the form of missions and reserves such as the Coranderrk Mission.